10mm Wargaming: Konev's Golgotha. 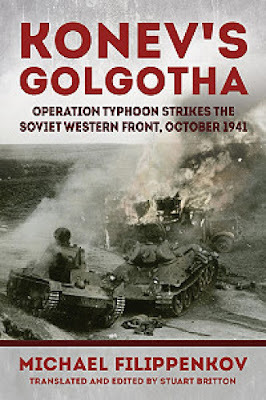 Operation Typhoon Strikes the Soviet Western Front, October 1941. Konev's Golgotha. Operation Typhoon Strikes the Soviet Western Front, October 1941. This book is a historical study of the events of October 1941 in the Viaz'ma pocket, based on documents found in the Russian Federation's Central Archive of the Ministry of Defense, the German Bundesarchiv, and the U.S. National Archives. Mikhail Filippenkov describes the events that took place through the simultaneous, comparative analysis of Soviet and German combat reports according to time, and in the manner of reporting from the places of those events as they happened. The author writes about these events with chronological accuracy, not on the level of army headquarters and higher, but exclusively on the level of the combat units down to the division-level, and with concrete geographical reference to the combat maps of those times. Particular attention is paid to the events that took place in the vicinity of Sychevka in Smolensk Oblast', because what happened there has never been deeply researched or examined by anyone in Russia. Unfortunately, research must rely primarily on the combat reports and combat documents of the units of the Wehrmacht's Panzergruppe 3., since almost no documents on the Soviet side have been preserved. They were either destroyed together with the units and formations trapped within the Viaz'ma pocket, or destroyed at an order from above to those units and formations which managed to escape encirclement more or less intact, in order to erase any record of the disaster.